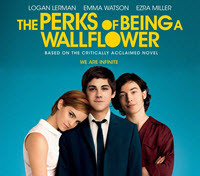 Movies Like The Perks of Being a Wallflower '+g+"
Like watching movies like The Perks of Being a Wallflower then check our list of teen romantic comedy movies similar to The Perks of Being a Wallflower. The Perks of Being a Wallflower is an 2012 coming of age comedy drama based on Stephen Chbosky's best selling novel with the same name.The plot revolves around Charlie (Logan Lerman) a lonely and nervous freshman befriends a pair of charismatic seniors, Sam (Emma Watson) and her fearless stepbrother Patrick (Ezra Miller) who welcome him to the real world. Don't forget to mention if we miss any as we keep on updating this list. 500 Days of Summer is a nonlinear romantic comedy movie directed by Marc Webb. The story is based on the memories of Tom's (Gordon-Levitt) failed relationship with Summer (Deschanel) who doesn't believe in true love. It's Kind of a Funny Story is an coming-of-age comedy directed by Anna Boden and Ryan Fleck based on Ned Vizzini's 2006 novel with the same name. The movie follows Craig (Keir Gilchrist) a 16-year-old clinically depressed teenager who realizes he's suicidal and checks himself into an adult psychiatric ward where he finds an opportunity to begin anew. The Art of Getting By is a 2011 romantic comedy movie starring Freddie Highmore and Emma Roberts. The story follows George (Highmore) a fatalistic teenager who hasn't done a real day's work in his entire senior year befriends beautiful and complicated Sally (Roberts) who makes his world upside down. Juno is a 2007 comedy drama directed by Jason Reitman. Juno MacGuff (Ellen Page) is a cool, confident and independent-minded teenager when faced with an unplanned pregnancy, she sets out to find the perfect parents for her baby. Running with Scissors (2006),...if you can think of more, then don't forget to mention it in comments.